Info "Set the clock the old-fashioned way." Digital Daze is a downloadable microgame in WarioWare: D.I.Y. and WarioWare: D.I.Y. Showcase. It was released on May 27, 2009 in Japan, April 26, 2010 in North America, and May 28, 2010 in Europe. The object of the game is for the player to set the correct time, shown by an analog clock, on a digital clock. A boy is shown saying: "What time is it?" Then an anolog clock is shown. However, even though the full 12 numbers are shown, the time will only be from 2 o'clock-5 o'clock. Then the player has to tap the grey lines in the first digit to make the hour shown on the anolog clock. If, after 15 seconds, the time is right, the player will win and the boy will say "Right!". 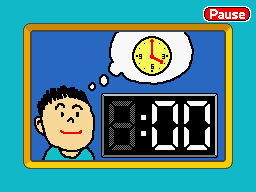 However, if the player has not made the correct time, then the game will be lost and the boy will say "Nope." This page was last edited on October 8, 2018, at 23:46.